Mitsubishi, the car company that broke my heart, is doing oddly well these days, with a veritable “sales surge” of crossovers. But, what if I told you it could be doing even better? Yes, that is the alternate future where Mitsubishi only sold us the Colt Ralliart Version-R Special. What is the Colt Ralliart Version-R Special? That’s simple. It’s a Mitsubishi Colt, but tuned by Ralliart, and versioned, r-ly, and special. Nice, right? Sounds like a good little car, particularly with that neat bodykit. Is that why I believe in the Mitsubishi Colt Ralliart Version-R Special? Yes. Well, yes and also that it was “Continuous Welding.” That just means that Mitsubishi seam-welded the chassis, like you do when you’re prepping a race car. All it did was make the car presumably more time-intensive to build, for a benefit of a claimed extra 10 percent of stiffness. The whole thing cost a hefty 2.320.500 yen back when it debuted in 2010, as Auto Evolution reported at the time, which is about $21,000 today. Only a few hundred were ever made, which is a bummer. 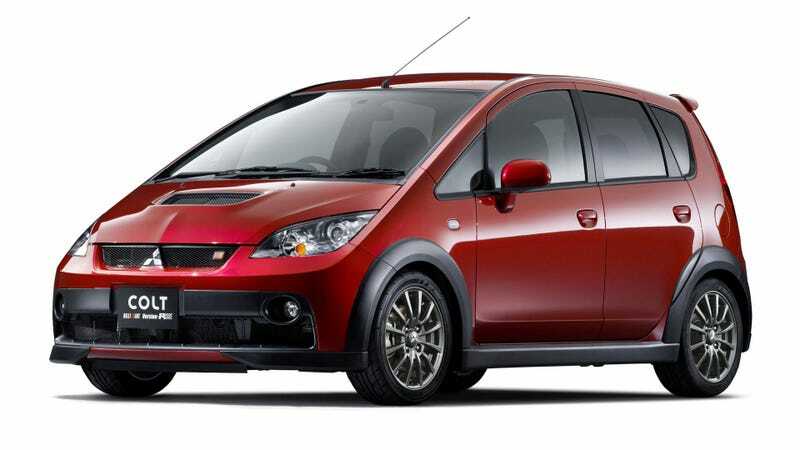 I would argue that all Mitsubishis should be Mitsubishi Colt Ralliart Version-R Specials. Is it too much to think that America would absolutely fall for this hot hatchback? That we would all throw reason aside when we see its turbo hood scoop? That we would all trade in our SUVs and muscle cars, Camaros and F-150s all streaming like lemmings into used car lots and Colt after Colt poured out of Mitsubishi dealers, themselves rapidly multiplying across the landscape, with squeaky tire marks from handbrake turns criss-crossing every intersection? Nah man. Just look at this thing. It rules.